Benishangul-Gumuz and Oromia states endured more violence with another ambush and retaliatory killing spree and then the killing of 11 Oromia police near the regional border in western Ethiopia. Hospital workers and other residents staged a protest on Nov. 28 in Nekemte after the officers’ bodies arrived from the borderlands. They were killed the day before in Limu Woreda of East Wollega Zone in Oromia. More than 200,000 people have been displaced from the wider area in the last two months and ongoing insecurity means they are receiving insufficient support. Insurgents fired at eight Gumuz teachers and agricultural officials on Nov. 20, killing two and injuring others in Yaso Woreda (see map), which is in the northeast of Kamashi Zone in Benishangul-Gumuz (B-G). The civil servants were walking around 35 kilometers to Yaso town from Chigisha Kebele to collect their salaries and the attackers were thought to be from Haro Limu Woreda in East Wollega (See map), according to a witness from Yaso. Gumuz youth followed the insurgents and killed several Oromo, Yaso witnesses said. Admasu Negasa, Haro Limu woreda’s security head, said those reprisals resulted in 38 Oromo deaths on Nov. 21. The regional border is closed by B-G militia, who are working with B-G security forces and the federal military, Admasu said. “They started this by saying we don’t need Oromo administration and we don’t want Qeerroos. They started shooting at Oromo people and killing them on Sep. 26, and since then each day people get killed,” he said. Researchers say conflict in recent decades between Haro Limu and Yaso was due to historical enmity and land disputes, and was exacerbated by corruption and the proliferation of arms. 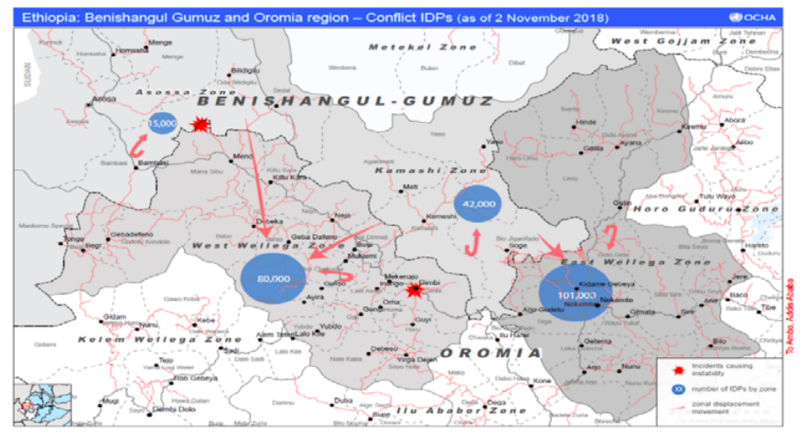 Turmoil over the last two months has been centered on Kamashi Zone, which is the southernmost chunk of B-G and is surrounded by Oromia on three sides. Serious violence began after Kamashi officials were murdered in an ambush on Sep. 26 in Meka Bila, Boji Dirmaji Woreda in West Wollega. B-G is the homeland of the Berta, Gumuz, Shinasha, Komo and Mao, as well as significant populations of native Amharic and Oromo speakers. Its capital is Assosa. In a 2007 census in Kamashi Zone, out of a population of 101,000, Gumuz comprised 61,000, Oromo 25,000 and Amhara 11,000. Attacks in Yaso and Mao-Komo Special Woreda of B-G this month were committed by rogue Oromo Liberation Front (OLF) elements, according to Musa Ahmed, B-G Administration and Security Bureau head. The OLF has been fighting for Oromo self-determination since 1973. It was a designated terrorist group in Ethiopia until it was legalized in June by parliament, and its main faction led by Daud Ibsa then returned in August. Militia allegedly with OLF ties attacked Ayeni Kebele in Yaso on Nov. 26. Resident Dabelo Bekare said one boy was killed, his mother injured, and five Gumuz houses burned. while three attackers died. On the same day, militants killed two Gumuz in Woja Kebele in Belo Jegonfoy Woreda in Kamashi. “I don’t know why the government of Ethiopia is keeping silent while we are suffering a lot,” said Abetu, a resident. Oromia and B-G’s governments pledged to restore peace this month, which was followed by a public discussion in B-G capital Assosa on Nov. 16. That was conducted by prominent Oromo activist Jawar Mohammed and politician Bekele Gerba, a leader of the Oromo Federalist Congress, after they had toured western Oromia. Jawar returned to Ethiopia this year after Prime Minister Abiy Ahmed invited all political actors to participate in democratic politics. Because of the positive discussions, on Nov. 20 the Chigisha officials had decided it was safe to walk to Yaso town, a local source said. Jawar told Ethiopia Insight that he blamed Gumuz militia for recent violence, but that was in response to road closures by Oromo groups. The first major incident in B-G that evolved into the serious violence occurred in Assosa on June 28. Berta youths demonstrated demanding the release of militia that had been kidnapped weeks before, allegedly by OLF-affiliated rebels. The territory that is now Kamashi was in Wollega province before Ethiopia was restructured in 1991. The OLF was involved in several military campaigns in the area around that period before it was forced out of Ethiopia in the early 1990s and replaced by Oromia’s current ruling party. Kamashi is primarily home to Gumuz who used to live in the Didessa area of Oromia and belong to a fragmented community that has been victims of slave raids for centuries, according to a research paper. The regional border is not properly demarcated and there have been sporadic outbreaks of violence over the last two decades over administrative power and resources such as gold, land, sand and bamboo, said another study. A number of Oromo in Haro Limu and elsewhere blamed agricultural investors based in Assosa for funding and arming the B-G militias. The B-G government said on Oct. 27 that 10 people who were giving military training for 51 people were captured in the region. 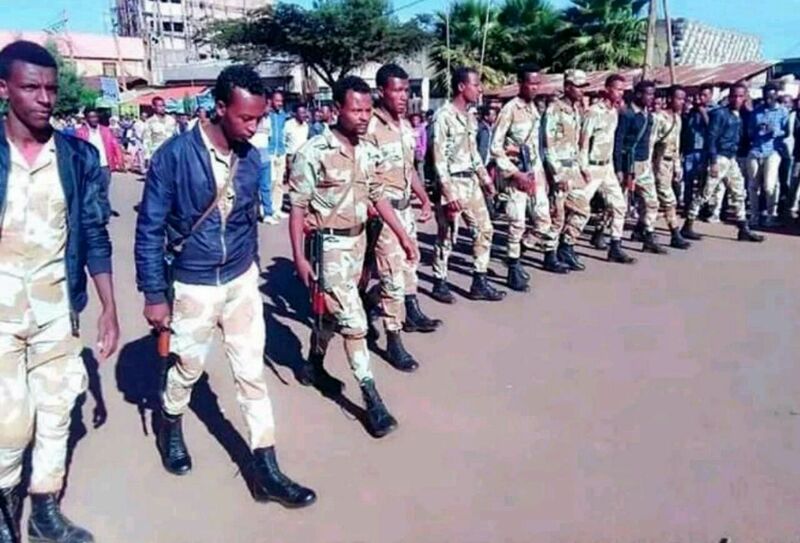 Oromia Police Commission spokesman Sori Dinka told Ethiopia Insight yesterday that militia have been trained and equipped by B-G’s government. “They are not civilian members of the community. We suspect that there are forces sponsoring from behind who are working against the current reform,” he said yesterday. Various officials have fingered anti-reform elements for fomenting unrest. After firing and replacing top security officials, prosecutions have begun against former senior members of the National Intelligence and Security Services (NISS) and others. Yesterday, Jawar blamed former Ethiopian soldiers and ex-NISS head Getachew Assefa, a politburo member of the Tigrayan People’s Liberation Front, for stoking violence in B-G. Getachew has been named in court as responsible for rights abuses, but Tigray’s government is thought to be unwilling to hand him over to federal authorities. A Tigray government official didn’t respond to a request for a response. Khalid Nasser, an activist based in Australia, said such claims were false and that Oromo aggression was the latest phase in oppression of indigenous people in B-G by Oromo, Amhara and Tigrayans. “The Oromo dream to deprive our people of their land is not fair and just, and as long as they attack our people I assure you that they will be confronted strongly,” he said. Accompanying any violence caused by a security breakdown during an ongoing political transition and by agent provocateurs, there has also been rising ethno-nationalism across the country, clashes over borders, as well as labor unrest. A source said Ethiopia’s new chief of staff Seare Mekonnen has replaced officers in the Western Command. A national political transformation is occurring after three years of protests in Oromia led to a rethink from the ruling coalition and the selection of Prime Minister Abiy. There has also been a political struggle since then in Oromia between Abiy’s ruling Oromo Democratic Party (ODP) and Daud’s OLF. Another OLF faction led by Galasa Dilbo is still abroad but plans to return after making an agreement with the government. The OLF’s Oromo Liberation Army (OLA) has attacked the military in Oromia but has not conducted cross-border raids into B-G, a well-placed source said. There is a plan to integrate OLA into the regional security apparatus, although residents near Dembi Dollo town to the south in Kellem Wollega Zone said the federal military is actively hunting the former rebel force. The ODP has begun a merger with the party of former OLF leader Leenco Lata, while Bekele’s OFC is expected to team up with the OLF. Yesterday the ruling ODP said violence on Oromia’s borders with B-G and Somali region was caused by corrupt elements using their political positions to foment ethnic conflict. The OLF said today there wasn’t any evidence of that and that neither the regional government nor the federal government has been taking action to stop the killing and displacement of Oromo. “We advise our people to get ready to defend yourselves by any means possible,” it said. “We have identified and registered the names of 66 people who were killed including the attacks that have taken place by armed forces in Yaso in B-G.
That included the death of 38 people who were stationed in two houses, 25 in one house and 13 in another house, on Nov 21 following the response to the militia attack, Admasu said. “People who escaped have witnessed that 34 people were dumped in one place. Until Nov 21, they were only killing male Oromo people, but since that day, they started killing females. For example they murdered a woman with her children last time in Chigisha on Nov 24,” he said. “It is now about two and half months, since the conflict started. They started this by saying we don’t need Oromo administration and we don’t want Qeerroos at first. And they started shooting at Oromo people and killing them on Sep 26, and since then each day people get killed,” he said. Admasu blamed officials and farmers in Yaso Woreda for organizing youths and attacking Haro Limu Woreda community members, giving the names of four woreda officials and farmers who he said had a leading role. He also said that soldiers were cooperating with these armed groups and doing nothing to stop them from killing Oromo people and being served by these armed groups with meat that was robbed and slaughtered for them. “According to information we have, any youthwho cooperates with them and kill or burn houses will be rewarded. They have started organizing it three months ago. Military forces are present from B-G side, but not from our side,” he said. Armed forces from B-G had crossed in to Haro Limu and started burning crops ready for harvest. According to Admasu, since Sep 26, these armed groups from B-G have killed 36 farmers on their farmland, six militia on duty, and burned 472 houses in Haro Limu alone. Admasu said it is not possible for Oromo residing in Kamashi Zone to get to Oromia as they are prevented by B-G militias. “No one can get close to the border, since they are stationed in ambush. People from Haro Limu are forced to stay seven to 10 km away from the border leaving their homes and properties. The woreda community left their farms behind without harvesting their crops to save their lives. Now they have started burning our crops which are ready for harvest,” he said. He also had complaints against the Oromia government. “We have been informing our zone but got no response, then we appealed to the regional government, no response, then groups of Qeerroo and elders went to President Office, but still now we got no response,” he said. There are more than 52,000 people who fled from Yaso that are in Haro Limu Woreda in six IDP camps, according to Admasu. According to Musa, insurgent groups thought to be a rogue OLF group from Oromia fired at six teachers on Nov. 20, killing two and injuring others. Musa said that these teachers were walking to Yaso town from Chigisha Kebele on Nov. 20 to collect their salaries. Following this attack, conflict occurred in Yaso town and nine Oromo people were killed and many fled away into forests to save their lives. He said that according to the information they got from Chigisha Kebele, which is not bordering Oromia, those insurgents that killed two teachers are rogue OLF because they are wearing the logo of OLF. According to information from the military, those who killed two people in Mao-Komo Woreda were rogue OLF and the killing of four Kamashi Officials in Maqqa Nejo was by those same groups. Since Sep. 26, the road that connects Kamashi to Oromia and Assosa was deserted and both sides blamed one another for its closure. Musa said that military forces are present on their side but since they are not present on the other side, it is not possible for B-G people to go to their region’s capital or to buy groceries. Musa said that these insurgents have killed two people in Mao Komo Special Woreda on Nov 11. Musa said B-G government has requested federal intervention in written form three times explaining that it is beyond the capacity of region, but the federal government did not bother to intervene. Published under Creative Commons Attribution-NonCommercial 4.0 International licence. Cite Ethiopia Insight and link to this page if republished. Ermias is an Ethiopia Insight reporter and administrator. Based in Burayu town in Oromia, he also does research and translation work. The author requested anonymity because they were worried about personal safety and/or a negative impact on their professional life.